When Supergiant Games announced Pyre, just 3 days before PAX East. I was incredibly excited. They are consistent PAX attendees and I’m a preacher of the Supergiant gospel. There’s no aspect of their games that I haven’t liked. From Jen Zee’s art, Darren Korb’s music, Logan Cunningham’s voicework, Greg Kasavin’s design, to Amir Rao and Gavin Simon who make it all happen. Coincidentally, they also happen to be some incredibly nice people. I got to talk with a few of them about Pyre, which you can check out in the attached video. As for my personal impressions of what I got to experience at the show, you can read (or watch) about that here. One of the biggest departures from previous games is that there is no one main character. Both Bastion and Transistor centered around The Kid and Red, respectively. In this game, however, there is a mysterious player-character called “The Reader” who is rescued by a wandering group of 3 exiles, similar to “the tactician” from the Fire Emblem series. 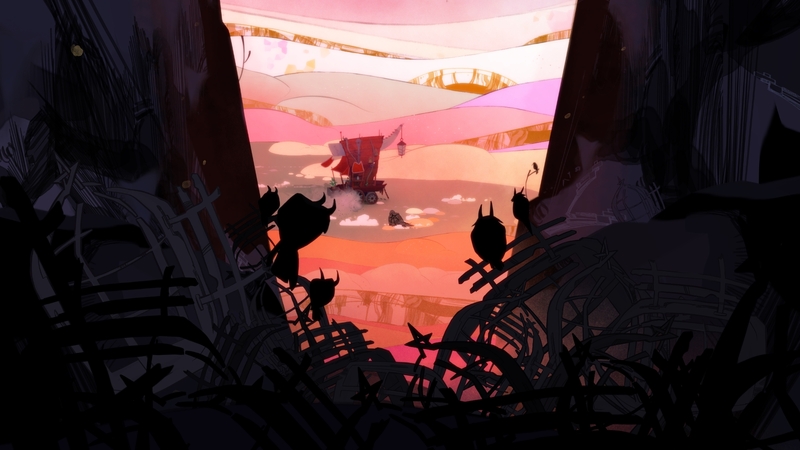 From what I played, it seems that Pyre’s gameplay can be divided into two parts, the Rites, and everything else. “The Rites” are a competition between teams of exiles, seeking to earn their freedom. Two opposing teams attempt to carry a celestial orb and use it to extinguish each others’ pyres. It plays like some sort of mystic, fantastical form of 3 on 3 basketball. I had found myself describing it as “action chess” as well, since you can only control one of three characters at a time, and each has their own movement properties and scoring values. For example, Jodariel, the large, horned exile moves very slowly, but her jumps cause shockwaves that knock enemies back and scoring with her does 3 points of damage. Rukey, the dog-like exile is swift, but can only score for one point.The harder it is to score with a character, the more points it’s worth. 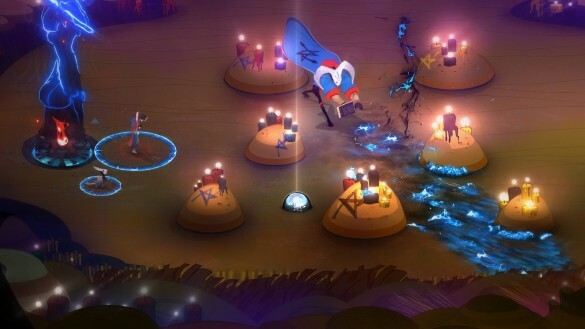 It’s all very symmetrical and sports-like, and while Greg said they may consider it, multiplayer in Pyre is still up-in-the-air. When you’re not participating in the rites, you’re navigating your team across the Downside, the wasteland all exiles are fighting to escape from. This portion of the preview was noticeably restricted, but there were many indicators of the things you could do. For example, your caravan has fuel and a limited number of times it can move before the rites take place. This seems to imply that exploring everywhere on the overworld will require careful management of resources, multiple playthroughs, or both. While some enemy exiles were non-descript and masked, others had fairly unique character portraits and dialogue, also reminiscent of the Fire Emblem series. Pyre looks to be a departure on all fronts, to varying degrees. The game world is substantially more alive and the story less single-character driven. 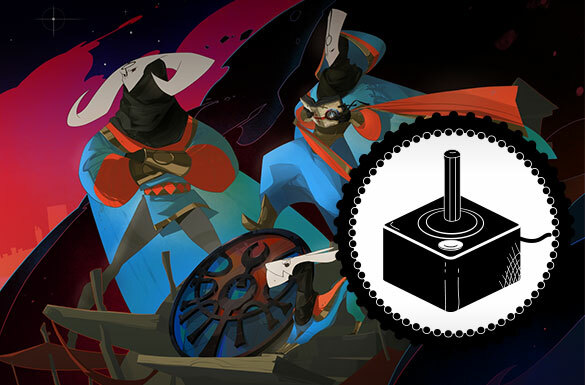 I’m excited to see Supergiant can do. 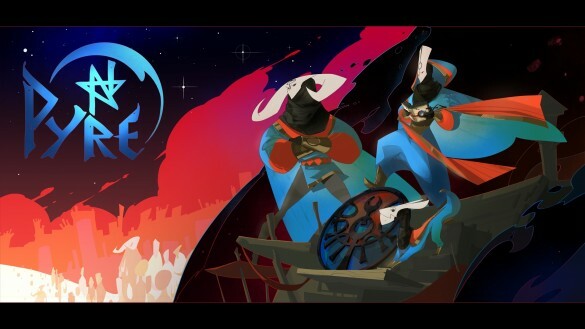 Pyre will launch sometime in 2017.